In the mid nineteenth century Charles Darwin developed a Theory of Evolution that is recognised as having impacted massively on human societies across the World - not least in the areas of faith and religious beliefs! These diverse impacts on so many aspects of human lives have been so far-reaching that a "Darwinian Revolution" has been accepted as having taken place. It is not unknown for political or cultural revolutions to take place but what might not be generally appreciated is that this use of the word "revolution" derives from an early scientific "revolution"! The revolution in question being the one where Nicolas Copernicus' view that the Earth revolved around the Sun, rather than itself being at the fixed centre of God's creation, was published to meet much controversy, in his work "Revolution of the Heavenly Orbs". Interestingly, Darwin hesitated about making his theory - which he had crafted into a 'publishable' sketch in the early 1840s - widely known in his own lifetime. His wife was sincerely religious and he also seems to have feared for his own and his family's perceived respectability if he made his potentially massively controversial evolutionary views public. It was almost completely as a result of another "evolutionary" theorist named Alfred Russel Wallace writing to Charles Darwin in 1858, seeking his aid in bringing his own, independently arrived at and virtually identical, evolutionary theorising to the attention of Sir Charles Lyell, who was a particularly prominent scientist, that led to Darwin agreeing to make his own ideas known. As I had not intended to publish my sketch1, can I do so honourably, because Wallace has sent me an outline of his doctrine? I would far rather burn my whole book than that he or any other man should think that I behaved in a paltry spirit. Do you not think that that his having sent me this sketch ties my hands? I do not in least believe that that he originated his views from anything which I wrote to him. As a sixteen year old Charles Darwin was encouraged by his patriachal father, a well-regarded and prosperous medical man, to study medical science with the view of entering the profession. In the event Darwin junior experienced a degree of distress at the sufferings of patients undergoing medical procedures in these times before the availability of reliable anaesthetics and this distress contributed to him withdrawing from his medical studies. Charles Darwin's medical course had been based in Edinburgh and whilst there Darwin seemed to show more real enthusiasm for private studies in Natural History than for his medical studies. Although he did subsequently qualify with a degree from Christ's College, Cambridge, that would have helped to qualify him for entry upon a life lived as a clergyman Darwin's passion for Natural History continued during his Cambridge years and led to his developing friendships with a Professor of Botany named John Stevens Henslow and with a Professor of Geology named Adam Sedgwick. Both Henslow and Sedgwick were impressed by Darwin's enthusiasm and abilities as an amateur naturalist and Henslow's contacts led to Darwin being offered a position as naturalist on a Royal Naval ship that was to sail on a long term voyage to the coasts of South America and beyond. Despite paternal opposition Darwin won the support of his maternal uncle, the rich pottery magnate Josiah Wedgwood II - for whose opinions the elder Darwin had a great deal of respect, such that the younger Darwin, whilst never formally abandoning what would presumably have been a respectable career as a clergyman, soon found his feet on the timber decking of HMS Beagle on the way to South America. The skeptical Charles Darwin, then twenty-nine years of age, proposed to his sincerely Christian first cousin Emma Wedgwood in the summer of 1838 and she accepted him as a good-hearted and companionable man with whom she hoped to be happy. I must now tell you what I think of him, first premising that Eliz. thinks pretty nearly the same, as my opinion may not go for much with you. He is the most open, transparent man I ever saw, and every word expresses his real thoughts. He is particularly affectionate and very nice to his father and sisters, and perfectly sweet tempered, and possesses some minor qualities that add particularly to one's happiness, such as not being fastidious, and being humane to animals. We shall live in London, where he is fully occupied with being Secretary to the Geological Society and conducting a publication2 upon the animals of Australia. Charles Darwin had grown up in and, despite his own skepticism after returning from his voyages, continued to live in a society that generally accepted biblical explanations of creation whereby the Earth and all of its unchanging, immutable, life forms were, as they were and as they ever had been, as a result of Original Acts of Divine Creation. As the Darwin's married life continued so also did some divergence of attitude towards matters of faith and religion between them. Darwin's acceptance of religious beliefs seems to have been further shaken by the untimely death of their well-beloved oldest child, Annie, at only ten years of age in 1851. It often happened that, whilst Charles Darwin would travel with his family to church, the skeptical man of science took himself off for a country walk whilst his wife and children attended church services. Nevertheless, Emma Darwin was later much involved, as an editor and critic, in the preparation of Charles Darwin's On the Origin of Species for publication in 1858-9. Darwin's decision prepare an abstract (i.e. his On the Origin of Species) of his researches for publication being largely based on his reluctance to see his own insights scooped by Alfred Russel Wallace!!! When Emma Wedgwood married her skeptical husband in 1839 he had already had, whether she was aware of it or not, at least two insights that Darwin regarded as being crucial to his Transmutation theory. 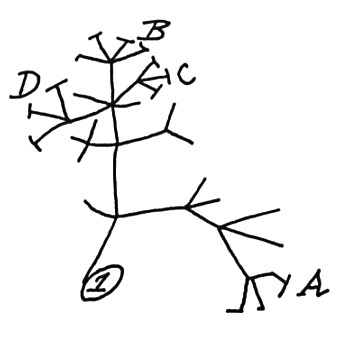 Charles Darwin's Tree of Life sketch from his Notebook B dating from 1837-8, (and deemed by editors of Darwin's papers to be concerned with his thoughts about the Transmutation of Species), shows his early - Tree of Life sketch - theoretical insight of how a genus of related species might originate by divergence from a starting point (1). Thus between A & B immense gap of relation. C & B the finest gradation, B & D rather greater distinction. Thus genera would be formed. — bearing relation (page 36 ends - page 37 begins) to ancient types with several extinct forms. This key stage in his development of an inherently persuasive hypothesis about a scenario where there would be a naturally explicable origin of species being Darwin's reading, late in 1838, of an Essay by the Reverend Thomas Malthus. To use Charles Darwin's own words from his Autobiography. "[F]ifteen months after I had begun my systematic enquiry, I happened to read for amusement Malthus on Population, and being well prepared to appreciate the struggle for existence which everywhere goes on from long-continued observation of the habits of animals and plants, it at once struck me that under these circumstances favourable variations would tend to be preserved, and unfavourable ones to be destroyed. The result of this would be the formation of a new species. Here, then, I had at last got a theory by which to work; but I was so anxious to avoid prejudice, that I determined not for some time to write even the briefest sketch of it." Thus when Emma Darwin wrote her letter of February 1839 to her new husband he was already well on the way to having a rounded Theory of the Evolutionary Origin of Species in place in his mind. ...I was very unwilling to give up my belief;—I feel sure of this for I can well remember often and often inventing day-dreams of old letters between distinguished Romans and manuscripts being discovered at Pompeii or elsewhere which confirmed in the most striking manner all that was written in the Gospels. But I found it more and more difficult, with free scope given to my imagination, to invent evidence which would suffice to convince me. Thus disbelief crept over me at a very slow rate, but was at last complete. The rate was so slow that I felt no distress, and have never since doubted even for a single second that my conclusion was correct. Given that we may probably accept there is a tendency in Man to be intensely intellectually curious, and that there have been several notable instances where intellectual curiousity and intellectual integrity have combined to bring about situations where what could be regarded as "scientific realism" has displaced what might be regarded as "comforting or flattering" explanations of existence, can we say that the Theory of Evolution was a theory just waiting to be arrived at and if not the gentlemanlike and restrained Charles Darwin or Alfred Russel Wallace then someone else would have come up with it - with similarly massive impacts on human societies across the World again not least in the areas of faith and religious beliefs! The Human intellect, however, can be led astray!!! The poets tell us that it is to be distrusted!! !